Senior Seminar Series! Sessions will be held on October 5th, November 2nd, and December 7th from 6:00 - 7:30 PM. 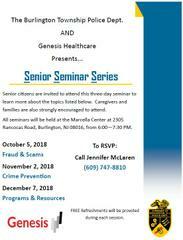 The Burlington Township Police Department and Genesis Healthcare will be hosting a Senior Seminar Series at the Marcella Center, 2305 Rancocas Road. All senior citizens, their families and caregivers, are invited to attend this three-day seminar or any portion thereof. Sessions will be held on the first Friday of each month from 6:00 - 7:30 PM (October 5th, November 2nd, and December 7th). Topics will include Fraud & Scams, Crime Prevention, and Community Programs & Resources. This is a FREE event and refreshments will be provided for. Contact Jennifer McLaren (609) 747-8810 or Officer Pew (609) 239-5852 to RSVP.